Recently Transmedics has been using a new portable system for keeping organs alive. 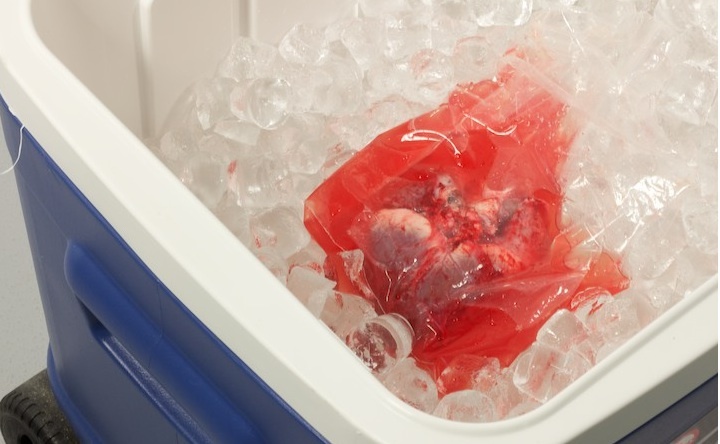 This system has been designed for Hearts, Lungs, Kidneys, and Livers to keep them alive and stable for much longer than the organ in a cooler of ice method which has become common. Transmedics has made a OCS – Organ Care System which pumps donor blood through the live functioning organ, enriches the blood with nutrients and oxygen, keeps the organ at a warm temperature with correct humidity where it’s comfortable and monitors the functioning of the organ. Hearts beat, Lungs breathe, Kidneys produce urine, and Livers produce bile just as they would in a human. You can even look in on the organ through the clear plastic case, something that wouldn’t normally be available in the diagnosing of a live, functioning organ. This ability to keep the organ alive and functioning during transplant should produce several benefits. Surgeons should be able to diagnose the organ to make sure that it’s healthy and disease free before transplant. Typically organs begin to degrade immediately and become too damaged after 4-6 hours in a cooler. This system will allow organs to travel further and in better condition thus increasing the availability of transplant organs and the success rate of transplantations. Not only will this help the recipient of the transplanted organ, but will also decrease the number of organs that go unused due to the inability to transport them long distances. Another benefactor would be the health care system in general. Expensive helicopters and private jets may not be needed to deliver organs to needy patients. The larger time window would allow more doctors to be available to perform the surgery. There would also be less rejection due to damaged organs so transplants wouldn’t have to be re-done as often. Don’t forget that there would be more organs available to the already long lists of patients that require transplants. The faster that people get their new organs the less time and money that would be needed to keep them alive and well with the use of expensive monitoring and machinery. This seems like science fiction, but right now in Europe the Lung OCS has been approved for use and is currently being used. In America there is a trial going on to determine the how well the Heart OCS works. In America alone there are 3.196 people waiting for a Heart, 1,754 for a Lung, 95,599 for a Kidney, and 16,975 for a Liver according to the current wait list today. There may be more people that don’t think that they can survive long enough or afford the transplant. Since you have to qualify for a transplant, we must also consider people who need a transplant but aren’t in perfect shape and are moved to the bottom of the list or don’t qualify. With the new OCS system there will be more people able to afford and successfully receive organs needed to keep them alive which is vitally important considering out of the 110,000 people that need transplants right now – last year there were only 35,000 organs available for transplant. .
More than half of the Hearts donated go unused, cold preservation significantly contributes to this problem. If they only had the "Brain" version of this device - I think I would have gone into the "cyborg" direction for this article.